Activities of daily living (ADL) are routine activities that people tend do every day without needing assistance. There are six basic ADLs: eating, bathing, dressing, toileting, transferring or walking and personal care. A person’s ability to perform ADLs is important for determining what type of long-term care may be required. I have already touched on in previous posts about the difficulties with shops and making food purchases. Although a great deal of effort and work has gone into developing these skills we are still a long way off of Dylan being independently able to shop for and feed himself. 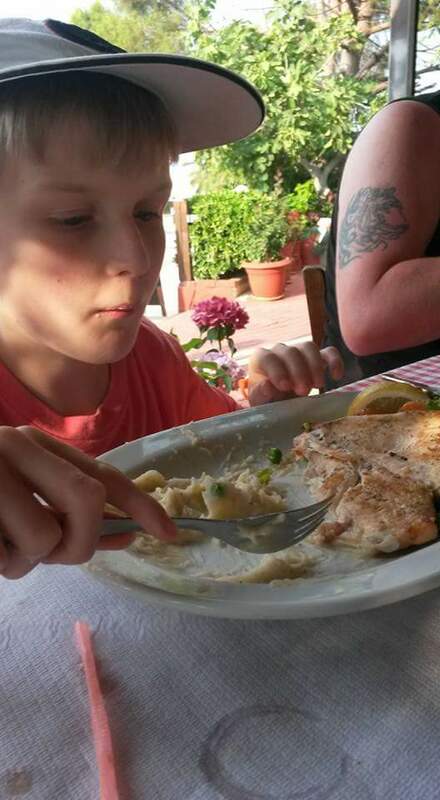 Dylan is now able to use a knife and fork but he lacks the physical strength, coordination and I think sometimes, confidence to be able to use his knife to cut up tougher foods such as bacon or meats. At 13 he still at times needs his food to be cut up for him. Dylan is unable to prepare foods for himself. He cannot safely use a cooker, the risk of heat and fire is currently lost on Dylan. When Dylan burns himself on a hot radiator he goes and sticks his hand straight back on it- almost to check its hot. Not sure if this is sensory seeking, he hasn’t quite correlated the heat to the item or if he simply likes it. Either way his lack of awareness is worryingly dangerous. The risks of gas, using sharp knives and an array of other items makes even making a sandwich a hazardous activity. To develop these skills we are looking at basic microwave meals to generalise skills. It’s an exciting time, albeit a bit out of our comfort zone but it seems that with every step forward there’s a splurge of dangers and unpredictability. For example – Microwave meals, a fantastic concept in the future that Dylan can go to the shop, buy himself some microwave meals and then come home and feed himself; that would be marvellous and will make him self-sufficient for a couple of hours! The plan is to get Dylan being as independent as possible, not a difficult one you may think. However within the first 5 minutes of unpacking the ready meals there are a range of dangers which we realise all need to be managed or will require extra teaching programmes. REALITY – We need to work on either directing more force on the fork or persevering with the wimpy pricking of the plastic until success. Otherwise he will lose focus and require adult intervention to continue with the meal prep thus reducing his independence. Next task is reading the instructions – when planning this it was described as Dylan will see the number of minutes on the back of the packet and setting the microwave accordingly. So again this will need teaching – how to pick out the minutes required, how to identify if the item is to be microwaved or oven cooked and if so then on what setting. Then we come to the microwave itself, Dylan has no electrical safety. He, as far as I am aware, does not know about the dangers of mixing metal and microwaves. REALITY – The health and safety risks are huge and if he is to be fully independent then he needs to be taught about electricity, the dangers and how to deal with them. All being well, the microwave pings and the food comes out; boiling hot food. Dylan needs to coordinate handling the hot container with a tea towel and bring it over to the plate. He needs to carefully remove the plastic wrapper – which is not an easy feat at best- and avoid being burnt by the escaping steam. In addition to this, even if he does everything right but by some unfortunate circumstance the fuse blows, there is a mechanical malfunction, the food catches alight or the food comes out uncooked; What does Dylan do? We will have to teach to cover every eventuality. The road ahead is long, exciting but long.